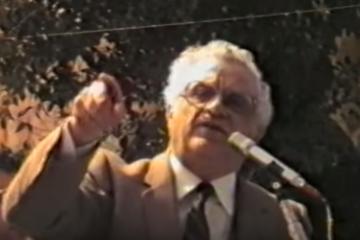 Eddie Fenech Adami praised the role of Gozitan personalities in defending the people’s rights during colonial rule, paying homage to Gozitan lawyer Fortunato Mizzi, founder of the Nationalist Party. After abandoning Gozo for 14 years, Labour Ministers were now trying to gain favour with the Gozitan electorate disguising the granting of rights as political favours. The Nationalist Leader reminded that exactly two years earlier Socialist thugs had violently attacked the Law Courts and the Archbishop’s Curia. 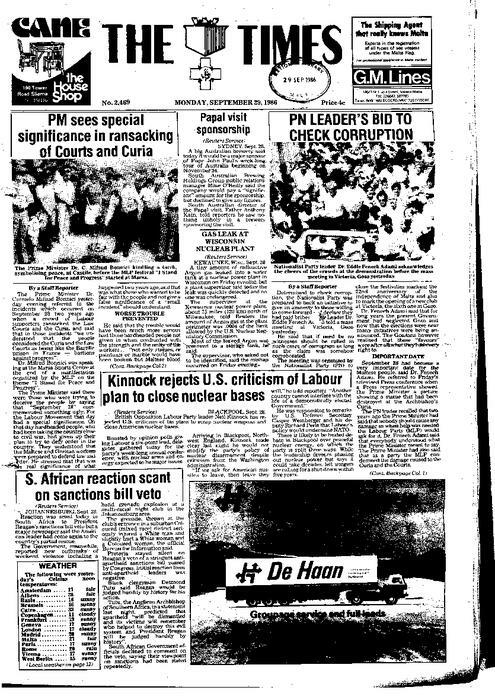 Resort to violence characterized Labour’s 14-year rule and was becoming more frequent. A future PN Administration would ensure that those responsible for these and other acts of political crime and violence would be brought to justice. After trampling on workers’ rights for 14 years, the Labour Party was trying to scare the electorate stating that a PN Administration would reduce social benefits, but the people would not be fooled. Fenech Adami said corruption within the Socialist Administration was rampant and on the increase and Prime Minister Karmenu Mifsud Bonnici was doing nothing to check and restrain it. 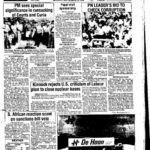 Political violence was a huge issue in the years before 1987 and in that year’s election. But Labour often tried to shift the blame on to the Nationalist Party. 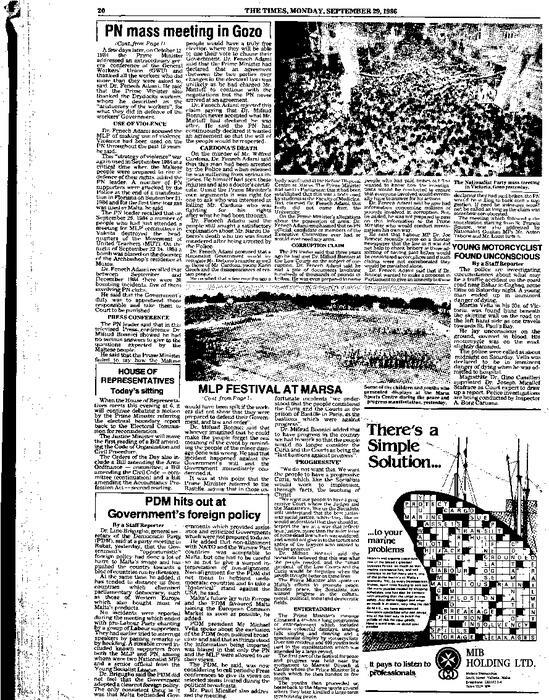 This mass meeting was the celebration of Independence which the Labour Government had struck off the public holidays list in 1971. It was held in Gozo, a week after the celebrations in Ta’ Qali, Malta. A large crowd for the small island of Gozo listened to Eddie Fenech Adami charge Labour Prime Minister Karmenu Mifsud Bonnici with Fascist lies days after the Labour leader’s comments trying to shift the blame onto ‘the Nationalists’ for the murders of Nardu Debono and Wilfred Cardona in the previous years. This was to happen again in a few weeks’ time when Pietru Pawl Busuttil was framed up for the murder of Raymond Caruana in the Gudja Nationalist Party Club. Wilfred Cardona had been beaten while in Police custody in December 1983 and had sued the Labour Government. But he was found dead in Ta’ Qali a few months later, in May 1984, after he was shot three times. The case was never solved. Nardu Debono was killed while being interrogated by the Police, including the Police Commissioner, on the 30th July 1980. His body was dumped by the Police in a valley in Ħal Qormi. In 1993, the Police Commissioner of the time (and till 1987) – Lawrence Pullicino – was found guilty in a trial by jury in relation to this case and given a sentence of 15 years’ imprisonment. 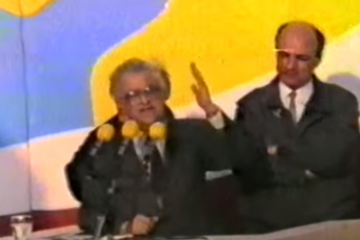 Il-vjolenza politika kienet kwistjoni kbira fis-snin ta’ qabel l-1987 u fl-elezzjoni ta’ dik is-sena. Imma kemm-il darba l-Partit Laburista kien jipprova jitfa’ l-ħtija fuq il-Partit Nazzjonalista. 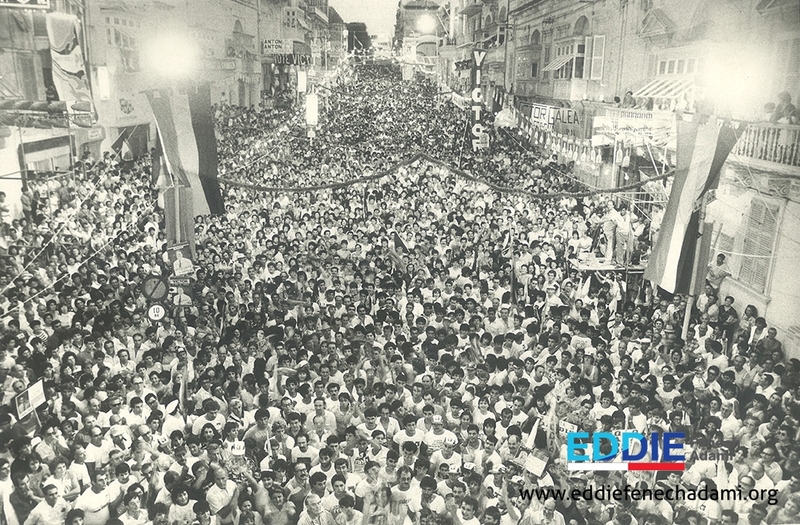 Dan il-mass meeting kien iċ-ċelebrazzjoni f’Għawdex tal-Indipendenza li l-Gvern Laburista kien neħħieha minn festa pubblika fl-1971, ġimgħa wara li din iċ-ċelebrazzjoni saret f’Malta, f’Ta’ Qali. Folla kbira ħafna għal Għawdex semgħet lil Eddie Fenech Adami jakkuża lill-Prim Ministru Laburista Karmenu Mifsud Bonnici b’aġir Faxxista: il-gideb fuq l-Oppożizzjoni. Dan minħabba li, ġranet qabel, il-mexxej Laburista kien ipprova jitfa’ fuq ‘in-Nazzjonalisti’ r-responsabbiltà għall-qtil ta’ Nardu Debono u ta’ Wilfred Cardona fis-snin ta’ qabel. Din il-ħaġa kellha terġa’ tiġri ftit ġimgħat wara dan il-mass meeting, meta sar il-frame-up fuq Pietru Pawl Busuttil għall-qtil ta’ Raymond Caruana fil-Każin Nazzjonalista tal-Gudja. Wilfred Cardona kien ġie msawwat waqt li kien arrestat mill-Pulizija f’Diċembru 1983 u kien għamel kawża lill-Gvern Laburista dwar dan. Imma l-katavru tiegħu kien instab mormi f’Ta’ Qali ftit xhur wara, f’Mejju 1984, wara li kien inqatel bi tliet tiri ta’ arma tan-nar. Dan il-każ baqa’ qatt ma kien solvut. Nardu Debono kien inqatel waqt li kien qed ikun interrogat mill-Pulizija, inkluż mill-Kummissarju nnifsu, fit-30 ta’ Lulju 1980. Il-katavru tiegħu ntrema mill-Pulizija stess f’wied f’Ħal Qormi. 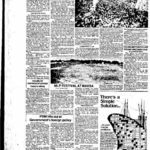 Fl-1993, dak li kien Kummissarju tal-Pulizija meta nqatel Nardu Debono sal-1987 – Lawrence Pullicino – kien instab ħati f’ġuri li kien kompliċi fil-każ u weħel 15-il sena ħabs. Sal‑lum konna naħsbu li meetings kbar bħal dan tal‑lejla jsiru biss f’Malta. Illejla, intom l‑Għawdxin qegħdin turuna li l‑eluf kbar kapaċi niġbruhom hawn ukoll, fil‑gżira tagħna ta’ Għawdex. Ġejtu llejla b’tant eluf biex tikkonfermaw ir‑rieda tal‑poplu Għawdxi li din id‑darba żgur, mingħajr dubju u b’ċertezza assoluta, ir‑rebħa sejra tkun tal‑Partit Nazzjonalista. 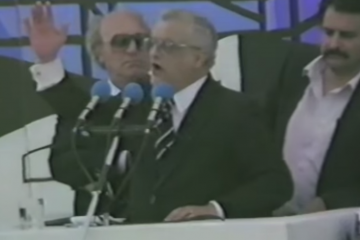 Għażilna din l‑okkażjoni biex nagħlqu hawnhekk il‑festi tat‑22 anniversarju tal‑Indipendenza ta’ pajjiżna u, verament, qed nagħlquhom b’mod grandjuz. Se nqerr magħkom. Ma kontx qed nistenna dawn l‑eluf illejla hawnhekk. Ħadd ma kien jistenna dan. Illejla fl-gheluq tal‑festi ta’ l-Indipendenza se niftħu każin ieħor ġdid f’Għawdex. Tul is‑snin, il‑poplu Għawdxi kellu sehem kbir fl‑indipendenza ta’ pajjiżna. Kien proprju Fortunato Mizzi, Għawdxi, li ta l‑bidu lil dan il‑Partit tagħna iktar minn mitt sena ilu. Kien hu li mitt sena ilu beda jssejjaħ lil Malta Nazzjon. Kien hu l‑missier tan‑nazzjon Malti, il‑missier tal‑patrija, il‑missier ta’ din l‑omm li tatna isimha. Għax, proprju minn dak iż‑żmien hekk imbiegħed, huwa diġà kien jemmen li dan il‑pajjiż tagħna huwa nazzjon u sejjaħ lill‑Partit tagħna il‑Partit Nazzjonalista. Mbagħad kellu jkun George Borg Olivier li, fl‑1964, issiġilla dan id‑destin ta’ pajjiżna bil‑kisba tal‑Indipendenza. Kif diġà fakkrukom illejla, meta Malta kisbet l‑Indipendenza tagħha fl‑1964, il‑gżira t’Għawdex kienet irrappreżentata fil‑Parlament minn ħames deputati li lkoll kienu jirrappreżentaw b’xi mod il‑fidi Nazzjonalista. Dak iż‑żmien, Għawdex kien kollu bi twemmin wieħedmaqgħud fil‑fidi tiegħu f’pajjiżna. U llum aħna ċerti li l‑poplu Għawdxi ser ikompli jagħti s‑sehem tiegħu biex dik il‑kisba tal‑Indipendenza ta’ 22 sena ilu tibqa’ tissarraf, kif ridnieha tibqa’ tissarraf, fil‑libertajiet ta’ kull wieħed u waħda minna. Tibqa’ tissarraf fid‑demokrazija għall‑pajjiż tagħna kollu. Tibqa’ tissarraf fil‑progress li beda bis‑serjetà f’dan il‑pajjiż mal‑kisba tal‑Indipendenza. Verament, l‑Għawdxin taw is‑sehem tagħhom tul l‑istorja ta’ pajjiżna. M’għandiex dubju li f’dan il‑mument ieħor storiku għal pajjiżna, intom l‑Għawdxin ser tkunu minn ta’ quddiem nett biex tagħtu s‑sehem tagħkom biex dawn l‑ideali tagħna jibqgħu ħajjin, jibqgħu sħaħ. Drittijiet mhux pjaċiri! Tal‑partit l‑ieħor iridu li lilkom l‑Għawdxin jittrattawkom qiskom xi ħafna boloh. Il‑partit l‑ieħor, wara li ddisprezza lil Għawdex għal snin sħaħ, issa f’daqqa waħda, għaliex qed jiġu Għawdex u jippruvaw jagħmlu l‑pjaċiri fi ftit xhur qabel l‑elezzjoni, mingħalih li jistgħu jgħidu li issa l‑folja inbidlet, li bis‑serjetà sejrin jieħdu ħsieb Għawdex. Jaħsbu li l‑Għawdxin huma boloh u ser jidħqu bikom! Jien ċert li intom qed tgħidulhom li l‑pjaċiri li tagħmlulna aħna inqishuhom drittijiet tagħna u, noħduhom mingħandkom, għax huma drittijiet tagħna. Imma b’daqshekk m’intomx se tisirqulna l‑vot tagħna. Verament, jien ngħid li intom l‑Għawdxin f’qalbkom tidħqu bihom meta issa jgħidulkom kemm ser jagħmlu ġid għal Għawdex. Issa, qed jgħidu li dawk li huma fil‑korpi ser iġibuhom jaħdmu f’Għawdex! Hekk ittrattawhom lill‑Għawdxin li kienu fil‑korpi qabel! U issa, lejliet l‑elezzjoni, mingħalihom li ser jisirqulhom il‑vot għax ser iġibuhom jaħdmu Għawdex. Jagħmlu sew iġibuhom jaħdmu Għawdex! Hekk kien imisshom għamlu tul is‑snin li għaddew! Imma boloh jekk jaħsbu li b’daqshekk ser jisirqu l‑vot tagħkom! Qabel kienu jgħidu li l‑iżvilupp t’Għawdex ftit li xejn hemm x’tagħmel għalih. Issa f’daqqa waħda ftakru fil‑proġetti li kien hemm u li abbandunawhom għal ħmistax‑il sena sħaħ. Mingħalihom li b’daqshekk jistgħu jidħqu bil‑poplu Għawdxi! Jien m’għandix dubju r‑risposta tagħkom x’inhi u x’sejra tkun. Nerġa’ ngħid, kif għidt diġà, ir‑risposta ta’ kull Għawdxi tkun: Dawn huma drittijiet tagħna ser neħduhom għax tagħna, imma b’daqshekk ħadd m’għandu dritt, ħadd m’għandu jistenna, li jieħu l‑vot tagħna. Aħna dejjem emminna li l‑poplu Malti u Għawdxi huwa poplu wieħed. Il‑Partit Nazzjonalista bil‑fatti wera li m’għandux ikun hemm aktar distinzjoni fil‑livell t‘għixien bejn Għawdex u Malta. Kien għalhekk li, fis‑snin sittin, Gvern Nazzjonalista poġġa l‑pedamenti li fuqhom kellu jinbena l‑progress ta’ din il‑gżira ċkejkna. Kien għalhekk li Gvern Nazzjonalista ta’dak iż‑żmien ipprepara l‑proġetti biex il‑gżira t’Għawdex ikun jista’ jkollha tassew l‑progress kollu meħtieġ. Għalhekk inġieb impjant biex jagħmel it‑tarmak li ħallewh jissaddad, jitmermer. Ma użawhx għal għaxar snin sħaħ! Issa mingħalihom li għax ser jagħtu t‑tarmak x’imkien, b’daqshekk jistennew il‑vot tal‑poplu Għawdxi. L‑istess għal xi xogħlijiet oħra. Issa, qed jgħidu li ser jirranġaw il‑korsa tat‑tiġrijiet taż‑żwiemel. Jalla jirranġawha. Tajjeb li jkun hawn il‑korsa f’Għawdex, imma b’daqshekk, ikunu boloh, u boloh huma, jekk jaħsbu li b’daqshekk ser jisirqu l‑vot tagħkom. Qed niltaqgħu f’Għawdex illum, fit‑28 ta’ Settembru. Id-data tat‑28 ta’ Settembru għall‑poplu Malti u Għawdxi sar għandha tifkira ta’ importanza, tifkira li huma mingħalihom sejrin inessuha. 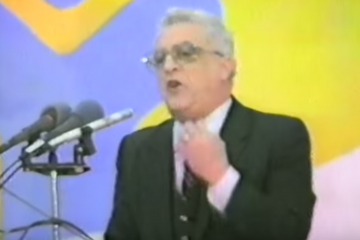 Smajtuh lil Karmenu Mifsud Bonnici meta deher fuq it‑television nhar il‑Ġimgħa! Meta Francis Zammit Dimech urih stampa ta’ statwa li kienet fil‑Kurja ta’ Malta li ġiet imkissra u staqsieh x’għamel il‑Gvern – min ġie mħarrek, lil min tellgħu l‑Qorti biex jagħti sodisafazzjon għal dak l‑att sagrilegu, għal dak l‑att ta’ vandaliżmu, għal dak l‑att verament ta’ vjolenza mill‑agħar, ta’ vjolenza faxxista – Karmenu Mifsud Bonnici, quddiem il‑poplu Malti u Għawdx,i tħawwad, tfixkel, tbegħren u nesa wkoll x’kien qal sentejn ilu. Dawk l‑inċidenti għamlu ħsara kbira lil Malta u Għawdex, għamlu ħsara lilna u xxokkjawna. Għamlu ħsara lil pajjiżna, għax dak li ġara dakinhar saret taf bih id‑dinja kollha tista’ tgħid. Bdew jipparagunaw dak li ġara dakinhar f’pajjiżna ma’ dak li ġara fil‑gwerra ċivili ta’ Spanja. Bdew jipparagunaw dak li ġara f’pajjiżna ma’ postijiet oħra fejn kienu intilfu l‑libertajiet tagħhom. U sentejn ilu, dakinhar filgħaxija stess, Karmenu Mifsud Bonnci kellem lin‑nies tiegħu f’Marsamxett. Dakinhar qallhom li ħadd m’għandu għalfejn imur u jkisser, għax meta jkun hemm bżonn li insejħulkom, insejħulkom. Dakinhar stess hekk qallhom! Qallhom ma’ kienx hemm għalfejn tmorru tkissru. Qallhom imma meta nsejħulkom, u kulħadd jifhem fil‑kuntest ta’ dak li kien qed jitkellem x’ried ifisser, insejħulkom. Ma kienx hemm għalfejn qal, jiġri dak li ġara lill‑Qorti u lill‑Kurja. Aħna bħala Partit dan nikkundannawh! Aħna ngħidulu: Dak in-nhar fil-għaxija, kont ipokrita meta għidt li tikkundanna dak li ġara. Fit‑12 t’Ottubru, hu stess qal li jirringrazzja lil dawk li għamlu aktar milli kien talabhom. U dawk li għamlu aktar milli suppost kien talabhom huma dawk li sentejn ilu marru jkissru l‑Qorti u l‑Kurja. Użajtuha kontra tagħna tul dawn il‑ħmistax‑il sena sħaħ. U, talli użajtu l‑vjolenza kontra tagħna, l‑poplu Malti u Għawdxi lest u determinat biex iwarrabkom minn hemm. 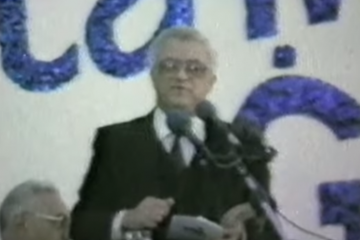 Jekk inħarsu lejn il‑fatti ta’ vjolenza, u partikolarment x’ġara f’Settembru tal‑1984, insibu bħala fatt li dawn għal darb’oħra reġgħu użaw l‑istrateġija tagħhom tal‑vjolenza f’mument tant kritiku għal pajjiżna meta verament kien hawn il‑periklu gravi li l‑poplu tagħna jqum, u kien lest li jqum, biex jiddefendi d‑drittijiet tiegħu. Irrid infakkar li l‑ewwel inċident tal‑vjolenza seħħ meta, fil‑21 t’ Settembru tal‑1984, iltqajna biex niċċelebraw l‑anniversarju tal‑Indipendenza. Kellna folla enormi, folla li sa dakinhar ma konniex rajna bħalha fl‑Arena tal‑Indipendenza! Meta spiċċat il‑manifestazzjon tagħna u kien għad baqa’ ftit eluf ta’ nies lesti li jmorru d‑dar bi kwiethom, dawk il‑ftit eluf ġew attakkati mill‑Pulizija. U, għall‑ewwel darba f’pajjiżna, intuża l‑gass tad‑dmugħ, mhux biex ixerdu xi folla, għax il‑folla kienet diġà tferrxet, imma biex mingħalihom ibeżżgħu lil dawk li kienu jimxu, u għadhom jimxu, wara l‑Partit Nazzjonalista. Infakkarkom, għaliex nhar il‑Ġimgħa, Karmenu Mifusd Bonnici, flok irrisponda għad‑domanda li saritlu, ma rrisponda xejn. Forsi għax tfixkel. Forsi għax tħawwad. Imma żgur wkoll għax risposta tajba ma kellux. 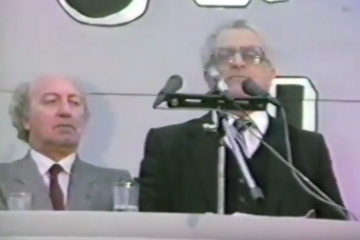 Infakkarkom li fil‑25 ta’ Settembru tal‑1984 kienu sejħu laqgħa għall‑kumitati tagħhom fil‑Belt, fil‑headquarters tal‑General Workers Union. Dakinhar, wara li spiċċat din il-laqgħa, numru min‑nies li kien hemm kienu marru u kissru l‑headquarters tal‑MUT, l-Union tat‑teachers. Tiftakruh dan? Hemm bżonn li tiftakruh biex tifhmu li meta aħna nakkużawhom li użaw il‑vjolenza, meta jaħsbu li hu tajjeb għalihom li jużawha, m’aħniex qegħdin nivvintaw imma qed nitkellmu dwar fatti li ġraw fl‑imgħoddi. Dakinhar, nerġa’ ngħid, wara li fil‑21 intuża’ l‑gass tad‑dmugħ kontra l‑folla Nazzjonalista, fil‑25 ta’ Settembru sar it‑tkissir tal‑headquarters tal‑MUT. Fi sbieħ tal‑24 ta’ Settembru, fil‑lejl bejn it‑23 u l‑24 ta’ Settembru ta’ sentejn ilu, kienet tqiegħdet bomba fuq l‑għatba tad‑dar tal‑Arċisqof ta’ Malta fl‑Imdina. Fortunatament, dik il‑bomba ma kenitx splodiet. Imma huwa fatt li dan ġara. Dak in-nhar, Karmenu Mifsud Bonnici qal li dik kienet xi ċajta. Kien hemm inkjesta minn Maġistrat. Illum nafu li l‑Maġistrat wasal għall‑konklużjoni li dik kienet bomba magħmula bis‑sena minn min hu kapaċi u jaf x’qed jagħmel u li kienet ħaġa providenzjali li, b’kumbinazzjoni, dik il‑bomba ma ħaditx. Tiftakru wkoll, li bejn Settembru u Diċembru tal‑1984, kien hemm għoxrin inċident ta’ bombi li tqiegħdu wara bibien, inkluż ħames każini tal‑Partit Nazzjonalista, waħda minnhom fil‑każin li kellna qabel fi Triq Vajrinġa, hawn ir‑Rabat. Ħames bombi li splodew kollha u fortunatament ma saritx ħsara kbira! Tridu tiftakru għalhekk kif dawn fl‑imgħoddi użaw il‑vjolenza meta dehrilhom li jistgħu jinqdew biha. Għalhekk aħna nakkużawhom li huma l‑vjolenza jikkundannawha kultant bil‑kliem imma s’issa m’għamlux dak li kien id‑dmir tagħhom li jagħmlu biex il‑vjolenza ma terġax titqajjem f’pajjiżna. Id‑dmir tagħhom kien li min għamel il‑vjolenza jaqbduh. Li min għamel il‑vjolenza jpatti skont il‑liġijiet ta’ pajjiżna billi jieħu l‑piena li tistħoqqlu. Izda nafu li ftit li xejn kien hawn każijiet f’dawn is‑sittax‑il sena li għaddew, fejn dawk li użaw il‑vjolenza nqabdu, fejn dawk li jużaw il‑vjolenza ttellgħu l‑Qorti. Nhar il‑Ġimgħa, Karmenu Mifsud Bonnci tkellem u sarulu mistoqsijiet mhux biss fuq dak li ġara fit‑28 ta’ Settembru ta’ sentejn ilu. Min ra dik il‑konferenza stampa – u meta ngħid min ra mhux qed ngħid biss għall‑partitarji Nazzjonalisti imma kull min għandu sens f’moħħu u jiġġudka l‑affarijiet b’mod oġġettiv – wara li spiċċat dik il‑konferenza stampa kellu kelma waħda xi jgħid. Jgħid: Miskin dal‑kap tal‑Partit Laburista! Miskin dal‑kap tal‑Partit Soċjalista li deher fuq it‑television! Deher fuq it‑television u wera li m’għandu ebda risposta serja x’jagħti għad‑domandi li qed jistenna risposta għalihom il‑poplu Malti u Għawdxi. Ma marx fuq it‑television biex jgħidilna kif f’Malta sejrin ikollna elezzjoni li ser tkun verament elezzjoni ħielsa. Elezzjoni li tassew tagħti d‑dritt lura lill‑poplu Malti u Għawdxu li, bil‑vot tiegħu, jagħzel lil min imexxih. Għall‑kuntrarju, meta staqsewh xi ħaġa fuq hekk, ir‑risposta tiegħu kienet li ftehim aktarx li ma jintlaħaqx tort tan‑Nazzjonalisti,għaliex hu kien inkariga lill‑Perit Mintoff biex ikompli n‑negozjati magħna u n‑Nazzjonalisti ma waslux. U jien ngħidlu, giddieb, int qatt m’aċċettajt dak li qal li jrid il‑Perit Mintoff! Il‑Partit Nazzjonalista ilu jisħaq ħames snin sħaħ li, biex dan il‑pajjiż tagħna jkun jista’ jserraħ moħħu li id‑demokrazija m’għadhiex aktar mhedda, hemm bżonn li jkun hawn ftehim li bih niżguraw li l‑vot tal‑poplu Malti jkun rispettat. Int qed tqarraq u taf li qed tqarraq. Taħseb li l‑poplu ma jifhimx. Taħseb li l‑poplu qisu xi tifel żgħir u tipprova tbellagħlu dak li trid. M’hawn ebda pajjiż fid‑dinja li jiftaħar li hu demokratiku u li fih hemm partit b’aktar min‑nofs il‑voti kollha u qiegħed fl‑oppożizzjoni. M’hawn imkien, u ma jista’ jkun hawn imkien, li għal xi żmien ikun hemm fih partit li jkollu l‑maġġoranza assoluta favur tiegħu u jkun fl‑oppożizzjoni. Qal: Ara l‑Ingilterra kemm jiftaħru bid‑demokrazija u l‑Konservattivi ta’ Thatcher għandhom biss 42 fil‑mija tal‑voti. Jien ngħidlu: Jekk fl‑Ingilterra l‑Konservattivi għandhom 42 fil‑mija u l‑Laburisti għandhom anqas minn 42 fil‑mija u l‑Liberali għandhom anqas minn 42 fil‑mija min jigverna? Mhux min l‑aktar li għandu voti? Min għandu l‑iktar voti f’pajjiżna? Meta jgħid li l‑Partit Nazzjonalista fl-elezzjoni ta’ l-1962 kellu biss 42 fil‑mija tal-voti qed jigdeb għax jaf li s‑sistema elettorali tagħna tagħti d‑dritt li inti tagħti preferenzi minn Partit għall‑ieħor. U fl‑aħħar, partit ikollu bħala voti tiegħu l‑voti kollha li jispiċċaw jaqgħu fuqu. U hekk ġara fl‑1962. U rrid ngħid li hekk ġara bis‑saħħa tiegħu, għax dak iż‑żmien kien imur fil‑pjazez u kien jgħid lin‑nies jivvutaw għall‑partiti li huma kontra Mintoff u hekk għamel il‑poplu Malti u Għawdxi. Il‑maġġoranza, il‑parti l‑kbira, tal‑poplu Malti u Għawdxi vvutat l‑ewwel għall‑Partit Nazzjonalista fl‑elezzjoni tal‑1962 u tal‑1966. Ivvutat wkoll lill‑partiti ta’ Pellegrini ta’ Herbert Ganado ta’ Mabel Strickland ukoll dakinhar. Imma mbagħad l‑parti l‑kbira ta’ dawn il‑voti kollha spiċċaw fuq il‑Partit Nazzjonalista. Dażgur li kellu d‑dritt li jigverna l‑Partit Nazzjonalista! Mela min kellu d‑dritt jigverna? Il‑Partit Laburista li kien miċħud mill‑poplu Malti u Għawdxi? Imma qal affarijiet oħra wkoll nhar il‑Ġimgħa. Saritlu domanda fuq il‑qtil, l-omiċidju, ta’ Wilfred Cardona. Jiddispjaċini li jkolli nsemmih hawn illejla, Wilfred Cardona hu bniedem li kien ġie arrestat ftit ġranet qabel ma nstab mejjet. Kien ġie arrestat mill‑Pulizija u wara li ntelaq mill‑Pulizija nstab li kellu feriti gravi. Instab li kellu l‑milsa minfuħa. Instab li kellu diversi feriti oħra. Hu kien ħareġ jgħid ma kulħadd li kien qala’ xebgħa waqt li kien qiegħed arrestat. Jekk nużaw l‑argument li uża Karmenu Mifsud Bonnici u ngħidu meta jkun hawn qtil infitxxu min kellu l‑interess li joqtol, aħna ngħidu: Min kellu interess li joqtlu lil dan il‑bniedem li kien qed jiġġieled għad‑drittijiet tiegħu wara li kien safa’ msawwat? Nhar il‑Ġimgħa, Karmenu Mifsud Bonnici tabilhaqq wera kemm hu bniedem irresponsabbli. Liema Prim Ministru fid‑dinja, meta jkun hemm omiċidju, joħroġ jgħid: “Jien għandi suspett min qatlu lil dan il‑bniedem, għax il‑Pulizija xi ħadd qalilha li qabel ma miet dan qal li kien ser jgħid xi ħaġa” ? Jien li naf fuq Wilfred Cardona hu li ftit ġranet qabel kien ġie jkellimni l‑uffiċċju. Hu wrieni l‑feriti li kellu u wrieni ċ‑ċertifikat tat‑tobba fuq is‑swat li kien qala. Jien fuq Wilfred Cardona naf li ftit siegħat qabel ma nstab mejjet kien qiegħed jieħu parti f’manifestazzjoni tal‑Partit Nazzjonalista li saret f’Ħaż‑Żebbuġ Malta. Nerġa’ ngħid, liema Prim Ministru li jixraqlu l‑isem, jipprova jinqeda b’omiċidju biex mingħalih iħammeġ lill‑partit li hu kontra tiegħu? Isiru dawn l‑affarijiet? Li jsiru l‑omiċidji u jippruvaw iwaħħlu f’ħaddieħor? Forsi għamilhom Mussolini. Forsi Jagħmilhom xi Pinochet. Forsi jagħmilhom xi dittatur . Hekk jagħmlu dawk li ma jemmnux fid‑demokrazija. Hekk jagħmlu. L‑istorja dan tgħallimulna. Fi żmien Mussolini qatlu lil Matteotti u Mussolini prova jwaħħal f’dawk li kienu qed jopponuh. Hekk jagħmlu l‑faxxisiti, kif għamel il‑Prim Ministru nhar il‑Ġimgħa li għaddiet! U daħħal lill‑Kummissarju tal‑Pulizija li suppost qal li Nardu Debono, Alla jaħfirlu, għamillu bomba wara l‑bieb. U jien ngħidlu fuq Nardu Debono l‑poplu Malti irid sodisfazzjon. Fuq Nardu Debono aħna għamilna d‑dmir tagħna. 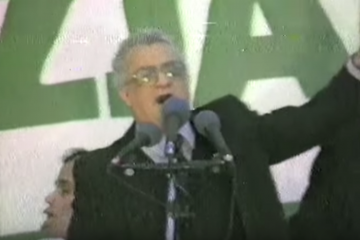 Meta Nardu Debono nstab mejjet fl-ahhar ta’ Lulju 1980 jien ktibt riżoluzzjoni u ktibt lill‑Ispeaker tal‑Parlament u għidtlu qed inressaq mozzjoni fuq il‑qtil ta’ Nardu Debono. Dan għaliex iċ‑ċirkostanzi li fihom instab mejjet Nardu Debono, wara li kien arrestat fil‑Headquarters tal‑Pulizija, lilna jagħtuna raġun li nqajmu ċertu suspetti. Lill‑Ispeaker għidtlu li kont qed nitlob li l‑Parlament jissejjaħ b’urġenza fis‑sajf biex inkunu nistgħu niddiskutu l‑każ tal‑mewt ta’ Nardu Debono billi jitwaqqaf kumitat tal‑Parlament biex naraw verament x’ġara. Dan sabiex jekk min hu responsabbli għall‑Headquarters tal‑Pulizija m’għandux x’jaqsam, inkunu nistgħu ngħidu li veru m’għandux x’jaqasm. U sabiex, jekk insibu li għandu nuqqas ngħidu li għandu nuqqas. Izda, dik il‑mozzjoni qatt ma tressqet quddiem il‑Parlament! Però, nagħtikom il‑wegħda tiegħi li l‑każ ta’ Nardu Debono ninvestigawh meta l‑Partit ftit xhur oħra jkun fil‑gvern. U sejrin ninvestigaw bis‑serjetà mhux biss il‑qtil ta’ Nardu Debono! Ninvestigaw bis‑serjetà dawk l‑omiċidji kollha li s’issa l‑Pulizja ma sabitx soluzzjoni tagħhom. Ninvestigaw il‑mewt ta’ Wilfed Cardona. Nerġgħu ninvestigaw il‑mewt ta’ Karen Grech. Nerġgħu ninvestigaw kif għebu ċertu nies minn pajjiżna. Ftit tax‑xhur ilu instab katavru f’bini tal‑Gvern, f’post li fih kanċell biex tidħol ġo fih, ir‑Refuse Disposal Centre fit‑telgħa ta’ Ħal Luqa f’Malta. Hemm kien hemm ħafna makkinarju antik tal‑Gvern u min hu responsabbli ddeċieda li jneħħih. Meta daħlet il‑gaffa u neħħiet l‑affarijiet u t‑trab, taħt it‑trab instab katavru. Il‑gazzetti, partikolarment il‑gazzetti tagħna, irrappurtaw din is‑sejba u ħarġu bl‑informazzjoni li dak kien katavru ta’ bniedem. Kien katavru li kien ġie użat mill‑Fakultà tal‑Mediċina, jiġifieri mill‑istudenti li jkunu qed jitgħallmu u kultant ikollhom ukoll jitgħallmu billi jaraw il‑katavru. Meta saret mistoqsija fil‑Parlament minn deputat tagħna Michael Falzon fejn staqsa lill‑Prim Ministru x’għandu xi jgħid fuq is‑sejba ta’ dan il‑katavru, dan l‑ewwel ma rrispondiehx u mbagħad qal li l‑Pulizija spiċċat l‑investigazzjonijiet tagħha u hi sodisfatta li dak il‑katavru ġie mill‑Università. U jien, hawn quddiemkom, qed ngħid li dik hija gidba! Mhux veru li dak il‑katavru ġie mill‑Università! Dawn l‑affarijiet qed ngħidhom biex kulħadd jifhem li meta ngħidu aħna li qed ngħixu fi żminijiet ta’ kriżi, fi żminijiet ta’ diffikultajiet kbar, kulħadd jifhem x’aħna ngħidu. Jien lill‑Prim Ministru ngħidlu: Għax irridu li f’dan il‑pajjiż titwettaq il‑ġustizzja, kull qtil li sar, kull delitt li sar u li s’issa ma nstabitx spjegazzjoni għalih, huwa dmir tagħna u se jkun dmir tagħna li dawn il‑każijiet kollha aħna neżaminawhom. Min sema’ l‑konferenza stampa ta’ nhar il‑Ġimgħa nduna żgur b’ħaġa oħra. Forsi l‑aktar waħda ċara: Li l‑Partit Soċjalista llum ma jsib xejn x’jikkritika fil‑Partit Nazzjonalista. Illum l‑unika ħaġa ta’ kritika li ħareġ biha l‑Prim Ministru kienet li jekk il‑Partit Nazzjonalista jkun fil‑gvern allura, imsieken ix‑xjuħ, il‑ħaddiema, l‑immankati u l‑batuti, dawn kollha ser imutu bil‑ġuħ taħt il‑Partit Nazzjonalista. Dawn kollha msieken ser ibatu. Ma tafx li intom lil dawn in‑nies naqqastulhom id‑drittijiet tagħhom? Ma tafx li intom lix‑xjuħ toħdulhom 60% tal‑pensjoni tagħhom? Ma tafx li intom naqqastu l‑pensjonijiet? Ma tafx li intom lill‑ħaddiema neħħejtulhom id‑drittijiet tagħhom? Ma tafx li kien il‑Gvern tagħkom li lill‑ħaddiema, flok ma jagħtihom ix‑xogħol bl‑overtime u jħallsahom, iħaddimhom bilfors bl‑overtime u ma jħallashomx? Trid tkun tassew wiċċek ma nafx biex ikun mgħotti u miksi biex toħroġ u tipprova tgħid lill‑poplu Malti u Għawdxi tivvotax għall‑Partit Nazzjonalista għax dawk kontra l‑ħaddiema u kontra x‑xjuħ. Aħna ngħidulu, lilu u lill‑polu Malti u Għawdxi, ara hawnx xi ħadd kapaċi jgħidilna li xi darba, xi darba waħda biss, kemm ilu jeżisti l‑Partit Nazzjonalista, mhux illum, kemm ilu jezisti, jekk qatt xi darba l‑Partit Nazzjonalista naqqas id‑drittijiet tal‑ħaddiema jew naqqas xi benefiċċju soċjali f’pajjiżna. Bħal tal‑paċi u l‑progress, din hi diska li dawn ma jafux idoqqu hliefha. Naturalment, semma ħaġa oħra, imma jien xbajt nitkellem fuqha! Reġa’semma l‑kwistjoni hekk imsejħa tal‑armi. Dan, kull darba li jidher, jgħid li ser jikxef xi haga dwar din il-kwistjoni. U, bomba tiela’ u bomba nieżla, jghid li ser ifaqqa’, spiċċa biex flok faqqa’ l‑bomba kien sparixxa hu. Issa dan l‑istess! Ser idum jgħidilna tal‑armi u li ser jagħmel dikjarazzjonijiet u li ser jikxef. Mhux x’għidna, x’qal li konna aħna lesti li ngħidu. Aħna ngħidulu, mhux x’konna lesti li ngħidu, x’għidna. Dak li għidna nibqgħu ngħiduh. Nibqgħu ngħidulu: Ebda uffiċjal tal‑Partit Nazzjonalista, ebda membru tal‑eżekuttiv tal‑Partit Nazzjonalista, ebda deputat tal‑Partit Nazzjonalista, ebda kandidat tal‑Partit Nazzjonalista, ma kellu, la għandu u anqas ser ikollu bżonn ta’ arma. Kontra tagħna ma jista’ jsemmi xejn. Imma kontra tagħhom kemm għandna xi nsemmu. Mhux biss li ma ġabux ix‑xogħol fil‑pajjiż, u li jrid ikun Gvern Nazzjonalista biex jerġa’ jkollna x‑xogħol fil‑pajjiż, imma nsemmu xi ħaġa oħra: Il‑korruzzjoni fil‑pajjiż. Nhar il‑Ġimgħa fuq it‑television, meta staqsewh fuq il‑korruzzjoni dan qal li, meta ltaqa’ miegħi xi tliet snin ilu, jien għidtlu li ma naqbilx li jieħu passi kontra xi wħud. Dan għandu mod kif mingħalih ibella’ lin‑nies, billi jdawwar il‑kliem. Jien kont għidtulkom dan f’xi meeting kbir li konna ltqajna fih. Jien kont akkużajt, u kont ilni s‑snin nakkuża lill‑Gvern, li fil‑pajjiż hawn korruzzjoni kbira. Darba kien qal li kien lest jiltaqa’ miegħi biex jien nagħtih l‑informazzjoni. Jiena mort u ltqajna l‑qorti. Dan kollu diġà smajtuni ngħidu, imma ser nerġa’ ngħidu. Ħadt miegħi m’ogħla hekk karti, dokumenti, u għidtlu dawn nista’ nagħtihomlok. Dawn hawn fihom korruzzjoni ta’ mijiet ta’ eluf ta’ liri. Għidtlu lest li nagħtik l‑informazzjoni. Anzi, għidtlu iktar! Għidtlu jien awtorizzat min‑nies li tawni l‑informazzjoni li għandi f’dawn il‑karti biex nikxifhom, nagħtik isimhom. Huma lesti li jbagħtu l‑konsegwenzi. Jekk hemm bżonn imorru l‑ħabs imbasta ma jmorrux il‑ħabs huma biss. Imbasta, għidtlu, tagħmel inkjesta li veru tkun inkjesta bis‑serjetà. Fakkartu li kien hawn min mar jgħid lill‑Prim Ministru ta’ dak iż‑żmien, qallu: JIen ħallast il‑flus biex nieħu xi ħaġa. Tajjeb dan? Kien qallu “Ħallast il‑flus?” u x’ġara? Dak li mar jikxef li hu verament ħallas il‑flus spiċċa l‑ħabs! Tajjeb hekk? Waqt li min suppost irċieva l‑flus, naturalment il‑ħabs ma marx. Għidtlu: M’inix dispost li nagħtik l‑informazzjoni. Int tgħid li sejjer tieħu l‑passi kontra kull min hu involut u ma tgħidlix kif ser tagħmel nagħtihomlok l‑affarijiet bis‑serjetà. Jien hekk nerġa’ ngħidlu llum. Izda mhux jien biss. Hawn, x’imkien hawn Antoine Mifsud Bonnici, ħuh. Tiftakru li Antoine għamel diskors ftit ilu u qal li lest imur jagħtih l‑informazzjoni. U jiena ngħidlu l‑informazzjoni li għandi issa mhux tal‑mijiet tal‑eluf izda tal‑miljuni. Tajjeb? Meta tgħodd kollox f’daqqa, taqbeż il‑miljun. Hekk saret il‑korruzzjoni f’pajjiżna! Imma m’inix ser nagħtih l‑informazzjoni u jmexxi kif irid hu. il‑Ħadd li għadda, d-deputat tagħhom l‑Avukat Joe Brinact kiteb artiklu fit‑Torċa dwar il‑korruzzjoni. Hu qal li hawn il‑korruzzjoni għal affarijiet żgħar. Pereżempju, għandek il‑file x’imkien u jekk ma tagħtix xi ħaġa, ma nafx jekk semmiex flus, imma ammont żgħir lil xi ħadd biex itellagħlek il‑file ’l fuq, qal, aktarx il‑file ma jimxix. Jien ngħid li hawn anke minn din it-tip ta’ korruzzjoni. Imma din m’hi xejn ħdejn il‑korruzzjoni tal‑mijiet tal‑eluf. Brincat kompla jgħid li f’Malta, l‑liġi tal‑pajjiż ma tgħinekx teqred il‑korruzzjoni. Brincat qal li jekk dak li jkun imur hu stess u jgħid: “Isma jien ħallast il‑flu,”, qal dak ikun kompliċi u allura jeħel hu wkoll. Qal, mhux biss! Meta jgħid hekk, skont il‑liġi li ma jkunx hemm korroborazzjoni, xi ħadd ieħor li jikkonferma, jew ċirkostanzi ċari li jikkonfermaw, dak jeħel hu għax ammetta u l‑ieħor, il‑ħati veru, għax daħħal il‑flus, dak ma jeħel xejn. U hekk ġara f’pajjiżna. Hekk kiteb l‑Avukat Brincat nhar il‑Ħadd li għadda! U ngħidlu lill‑Avukat Brincat: Għamel proposta fil‑Parlament u aħna nissapportjawha. Li ngħidu, isma’, dan il‑pajjiż tant kien hawn korruzzjoni fih, tant hawn korruzzjoni fih, li l‑korruzzjoni saret ħaġa ta’ kuljum. U t‑tort issa mhux ta’ min qiegħed iħallas il‑flus, izda ta’ min ħoloq din is‑sistema u ħlief bil‑flus ma jaqdikx. Ngħidulhom li dawk: Ejjew għidulna. Ma teħlu xejn. Jekk irid l‑Avukat Brincat, anke ngħidu m’hemmx għalfejn xhieda, mbasta jkollna xi korroborazzjoni, xi ħaġa li turi verament li din hija l‑verità, u nibdlu l‑liġi. Nagħtu l‑amnestija li hemm bżonn. Anke issa! M’hemmx għalfejn noqgħod nistenna li jagħmilha l‑Gvern Nazzjonalista. Il‑Gvern Nazzjonalista l‑korruzzjoni ser jieħu ħsiebha, biex ikunu jafu. Imma, jekk iridu anke issa. Jekk Karmenu Mifsud Bonnici jrid jagħti prova bil‑fatti li l‑korruzzjoni jrid jibda jeqridha minn issa, għandu l‑mezz kif dan jista’ jagħmlu. Il‑bqija, aħna ngħidulu li l‑fatti tiegħek juruna li inti l‑korruzzjoni ma qridthiex imma qiegħed tkabbarha. Ngħidlu li int ħati daqs min hu korrott, għax min jaf bil‑koruzzjoni u għandu l‑mezzi u s‑saħħa biex dik il‑korruzzjoni jeqridha u ma jagħmel xejn, jew kważi xejn, hu korrott daqs min jagħmel il‑korruzzjoni. M’għandix dubju, li intom Għawdxin u Maltin issibu mitt ħaġa, mitt raġuni ‘l għaliex l‑elezzjoni li ġejja sejrin tivvutaw lill‑Partit Nazzjonalista. Dan turuh bil‑preżenza hekk qawwija tagħkom fl‑attivitajiet tagħna. Dan nuruh ukoll bil‑fatt li qegħdin niftħu tant każini: Sitta f’Għawdex u numru ieħor f’Malta. Il‑poplu Għawdxi u Malti jħoss dan il‑bżonn. Li jesprimi ruħu b’mod li jidher, b’mod li jipparteċipa, b’mod li jikkommetti ruħu, b’mod li jkollu sehem, f’dn il‑ġlieda qaddisa f’pajjiżna. Għalhekk illejla ġejna hawn, mhux biss biex infakkru l‑anniversarju tal‑Indipendenza ta’ pajjiżna, imma ġejna hawn ukoll biex niftħu uffiċjalment dan il‑każin hawn ir‑Rabat. Każin f’din it‑triq prinċipali li dari kienet imsemmija, kif kien iddeċieda l‑Gvern Nazzjonalista tas‑snin għoxrin, il‑Korso Fortunato Mizzi, li issa saret Triq tat‑Tiġrija, triq li verament jixirqilha isem ferm iktar sabiħ minn dan. Din it‑triq f’Għawdex kienet imsemmija għal Fortunato Mizzi, Għawdxi, kif għidt, li proprju kien hu il‑bniedem li jispira lill‑Maltin u ‘l‑Għawdxin biex jiġġieldu għall‑indipendenza tagħhom. Għawdex ta numru kbir ta’ patrijotti lil pajjiżna. U, ċertament tana bniedem li jistħoqqlu kull unur, il‑bniedem li qed insemmu dan il‑każin għalih, it‑Tabib Anton Tabone. It‑Tabib Anton Tabone jien niftakru biss fil‑Parlament. Sintendi, jien ma kontx fil‑Parlament. Qatt ma’ kelli x‑xorti, sa fejn niftakar jien, li niltaqa’ miegħu personalment u nkellmu. Però, jien ukoll kelli x‑xorti li nifhem kemm kien bniedem ta’ onetsà kbira. Kemm kien bniedem ta’ dedikazzjoni kbira. U mhux qed ngħid onestà u dedikazzjoni biss fil‑politika. Qed ngħid li kien bniedem ta’ onestà kbira u dedikazzjoni kbira fix‑xogħol tiegħu tul ħajtu kollha u fix‑xogħol ta’ tabib. Jiena ċert li intom l‑Għawdxin tiftakru it‑Tabin Tabone bħala l‑bniedem li kien lest li jgħin lil kulħadd. Li kien lest li jagħti s‑servizz tiegħu minn qalbu lil kulħadd. Irrid ngħid ukoll, bniedem li għex u miet fqir. Fqir għax kulma għamel kien li jagħti is‑servizz lil ħutu l‑Għawdxin fi gżirithom. Huwa ċertament ta’ ezempju għalina lkoll. Ta’ eżempju anke fil‑ħajja qasira politika tiegħu. Għaliex meta ħass il‑bżonn li jagħti l‑kontribut tiegħu fil‑qasam politiku ma qagħadx lura. Ħareġ għall‑elezzjoni tal‑1962 u l‑poplu Għawdxi għazlu bħala wieħed mid‑deputati tiegħu. Nieħdu pjaċir għalhekk illejla li niddedikaw dan il‑każin ġdid tagħna lit‑Tabib Anton Tabone. Ħbieb tiegħi, baqalna ftit xhur oħra biex nissiġillaw ir‑rebħa għal pajjiżna bil‑vot tagħna. Dawn iridu jkunu xhur ta’ ħidma kbira, għax m’hemmx dubju, u dan qed narawh kullimkien, li numru kbir ta’ dawk li qabel kienu mal‑partit l‑ieħor, illum tilfu l‑fiduċja fil‑partit tagħhom u ġejjin magħna bil‑mijiet u bl‑eluf. Tibżgħux tersqu lejna, tibżgħux minn Gvern Nazzjonalista. Gvern Nazzjonalista jkun verament il‑gvern tan‑nazzjon kollu. Ikun verament il‑gvern li jagħmel il‑ġid għal kulħadd. Ikun verament il‑gvern li jerġa’ jgħaqqad lil dal‑poplu tal‑gżejjer tagħna. Għalhekk naħdmu f’dawn il‑ġimgħat u x‑xhur li ġejjin. Naħdmu lkoll biex nassiguraw, mhux tant ir‑rebħa għall‑Partit tagħna, imma nassiguraw li l‑Partit tagħna jkun verament jista’ jġib ix‑xogħol, il‑ġustizzja u l‑libertà għal pajjiżna.